Here is my boat with my 7yr old son & fishin partner! I was looking for a modern, high performance design with enough room in the cockpit to avoid banging my ankles on a barney post. I ended up with all that and a bag of chips. Unfortunately, the boat is so powerful, that I have no hope of single handing it. On a good day, it requires 3 men to keep it flat. Now how about the details...I can see it's stripped, but what design, what weight, materials, etc. Thanks stripperguy, it is hard to say the style. My father has had different plans kicking around for probably 40 years and he just modifies them to fit. We were going for a pack boat style and ended up at 12' and about 35 lbs. It is cedar strip and had a natural finish until a few years ago. 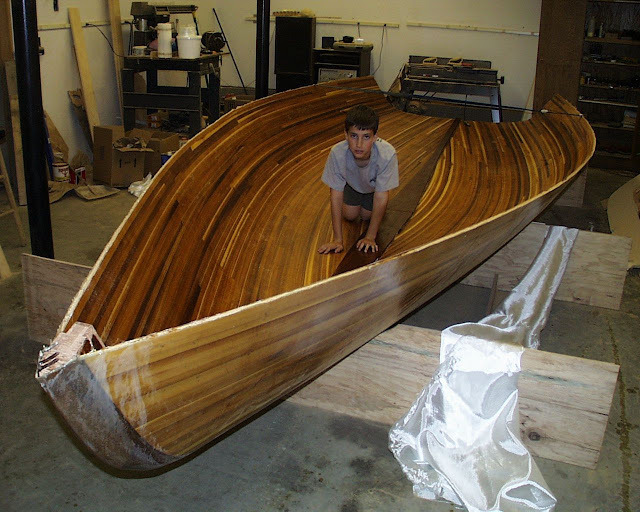 The fiberglass we used was some old leftover resin from another canoe project. Something weird happend with it and it left dark liver spot type of stains on the outside from sitting in the sun. When I stripped off the poly and fixed some cracks the only way to get through the dark brown spots was to sand a lot of wood away. 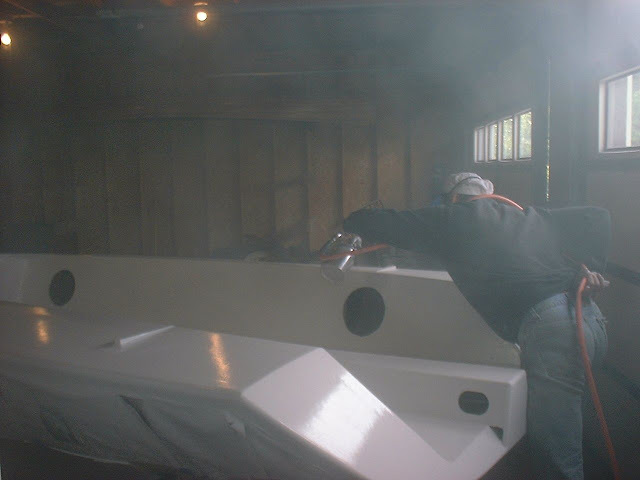 That is when I decided since it is primarily a utility boat it would get a nice green paint job! This was a father son type project that we did around 20 years ago (man I'm getting old!). My Dad's excuse for building was that my Mom needed a canoe, she has no interest in soloing. Since I used it most, when I bought a house I took it home with me! We had already built a half dozen others, I will need to search for pictures of them. They were all purpose built for our trips, some wider, some longer, a nice 14' solo that was lost when my sister and her husband split (long story). Anyway I have a 15' Cedar strip tandem that gets used occasionally that is in need of some repair and my father still has a stripper he made out of pine that is beat to heck but has been up the Oswegatchie river more times than I could count! Here are some of the dark spots, the only way to get them out was to sand through all the glass and into the wood a good bit. Since I had no plans on reglassing the entire boat I just fixed the cracks and painted it. This boat is a wonderful paddler but it was never intended as a show boat. Stripperguy that is a gorgeous sailboat you built. I have thought about building one to play around on the Hudson with near my home. It will not be anywhere near as show quality as yours though! I Need it to be a single handle capable boat though. Most of my sailing will be just me out for playing in the afternoons. I have two young daughters that for now would be too little to help much. We will see what the future holds! That particular design is called a K19, dreamed up by Anthony C. Gondola, N.A. His company is called Northwest Marine Design. Pretty sure he is still selling plan sets. He had many high performance designs, some larger, most smaller than the K19. My "new " ride. It needs a little work. Circa 1885, JR Robertson( we think. Its got some Gerrish stuff). It was on its way to the dump when we spotted it and seized ownership. Edit. turns out it may be an early Boston courting canoe. Not the absence of a thwart and the presence of some fittings that supported metal arches. Yes this was a canoe for "fooling around". Who said that Canadians started that? The heyday of the courting canoe were in the Boston area. Last edited by yellowcanoe; 07-17-2013 at 08:14 PM.. Here's a view from behind showing that beautiful hull...Oooh, I love that boat!! Wow - I can see the tumblehome in that picture. The one you posted on the canoe design thread didn't show it very well. Photos by Harry Kern, Whitehorse, YT. Phew!! I know you train quite a bit for those long races, but does everyone train together? And do you train in that boat? It can't be easy to aim that boat through those waters. Do you travel with gear? No swampings or capsizes? Yes, we train extensively. All team members are many year veterans of the Adirondack 90-miler. Everyone on this YRQ 2013 has paddled the Yukon 1000 in a voyageur canoe, some of us twice, and some have done the YRQ more than once before. This boat can be outfitted for either 6 or 7 paddlers for the YRQ. For the Y-1000 the extra gear and food required only allow for 6 paddlers. Unfortunately the team members live somewhat geographically dispersed, from near the Canadian border of NY, to central and south central NY, to western PA. Prior to our first Yukon race we trained together much more extensively than this past year, but we all train and enter multiple races in various forms together or separately throughout the season. The boat owner (in the stern) is good enough to transport the Yukon voyageur, or another somewhat smaller voyageur he owns, so that we take turns in minimizing travel for training near each other's homes. He is an excellent sternsman and knows how to steer his boat very precisely with his trained team. In the bow I frequently provide a draw or two where needed for course maintenance, or lean heavily into power draws (my favorite) and posts for more radical turns. When an extremely radical course change is needed, paddler in seat #2, and the paddler immediately in front of the sternsman know how to provide their power to assist the turn. Training together in the Yukon voyageur canoe makes a very cohesive team as we learn each other's capabilities and needs as a team. All but the bow and stern seats are mounted on wheels smoothly rolling side-to-side, so that on a "hut" each paddler slides to the opposite side, putting hip to the gunwale for best paddling positon. If one person misses the seat slide it can give quite a scare by tipping. If more than one person misses a slide, we are in serious danger of getting wet. We hut approximately every 90-100 strokes on the flat, sometimes more, sometimes less, as needed during maneuvers. Training for sliding on the huts, and training for maintaining power on one side for 100+ strokes are the most important aspects of our training. You may notice in the Five Fingers Rapids photo that each paddler has a yellow spray skirt installed. We use these mainly just for places like the Five Fingers Rapids (FFR), or for bad weather and rolling white caps as is often found more often than not on 30 mile long Lake Laberge. In the bow I often take the full force of an oncoming wave to my torso, and many gallons of water would end up in the boat without the cover, which would then make the boat very unstable. We have never capsized in the 40 degree water of the Yukon, but did once when training in that boat in high waves on the St. Lawrence River. Fortunately shore was a short swim away. In the smaller Adirondack voyageur canoe capsizes have occurred, mainly due to powerboat enhanced windy wave wash dumping large amounts of water onboard over the lower freeboard of that narrower boat. During the YRQ race it is common for some racers to lose control when going through the large standing waves of the FFR. A safety boat is always stationed there for rescue during the YRQ, but there are no safety boats on the Y-1000. This year two boats did capsize on the FFR. You can see in a photo sequence a women's voyageur canoe capsizing in Harry Kern's online photo album. They took a line too far right of where they should have gone, straight into huge standing waves. With no spray cover they were doomed to a massive onload of water and instability. For gear, there is an extensive list of mandatory gear on the 440 mile YRQ, including tents and sleeping bags rated to 20 degrees, at least 2 sets of warm clothing for all, a stove and pot, and many other items. The race officials are rather fussy about making sure it is all carried, and we go through a pre-race day detailed visual check of absolutely everything, plus more random checks just before race start, during the two mandatory rest stops, and at the end of the race itself. The first mandatory rest stop occurs at 190 miles, which is 22 non-stop hours into the race for us. All gear is randomly checked again when we land and again before we leave precisely 7 hours later. Interestingly, for the Y-1000 there is less formality of requirements and gear. Apart from the start and finish, the race is totally unsupported, and the rules require that to be so with no mid-race pit crew support allowed except for emergency egress. But you had surely better know what you are doing for the Y1K. Last edited by Wldrns; 07-17-2013 at 09:29 AM..
That photo reminds me of the quintessential father/son trip to the ADKs.